La Jolla, CA : Kane/Miller Book Publishers, 2004. Marc can't sleep because he is afraid, so his mother comes up with all sorts of creative solutions for his fears. It's bedtime, but Marc just can't sleep. He's scared. He's worried. What if a giant mosquito gets into his room? What if he falls out of bed? What if the moon melts? Mom to the rescue!A mosquito repellent teddy bear, notes to the wind and the moon, mountain climbing ropes...nothing works. What's a mom to do? The solution turns out to be simple enough to help even the most reluctant sleepy head off to dreamland. PreS-Gr 2-Keselman takes an imaginative approach to a familiar subject. Marc voices a series of nighttime fears to his mother, who attempts to soothe him in creative ways. When he tells her that he is afraid of being bitten by a giant bug, she makes him "mosquito-proof pajamas" (a wire basket), a helmet (colander), and a sword (straining spoon). She gives him a mountain-climbing rope and parachute to prevent falling out of bed, invents an "invisible trap for catching ghosts," and even climbs onto the roof to keep watch. When these efforts all fail, she admits she doesn't know what to do and sits down to listen while Marc tells her about his concerns. Of course, he falls asleep before he even begins. Villamuza's cartoons, done in earth tones, are simple and splendid. 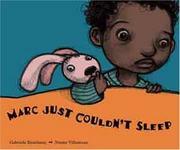 Marc is an appealing character with dark skin, curly black hair, and large round eyes. The artwork captures the affection he and his mother share and the large compositions are ideal for storytime.-Gay Lynn Van Vleck, Henrico County Library, Glen Allen, VA (c) Copyright 2010. Library Journals LLC, a wholly owned subsidiary of Media Source, Inc. No redistribution permitted. Marc's mother provides outrageous remedies for his bedtime fears, such as giving him ""mosquito-proof armor"" and standing guard on the roof. But nothing works until she sits on his bed and says, ""...tell me everything."" Some views of Marc are almost too cute; however, the illustrations portray the mom's frantic efforts with humor and lend poignancy to the resolution. (c) Copyright 2010. The Horn Book, Inc., a wholly owned subsidiary of Media Source, Inc. No redistribution permitted. All rights reserved.